Insect traps are a whole different and interesting section of the trap collecting. 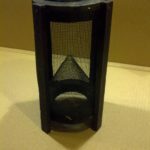 In the days before fly screens and chemical sprays, trapping was really the only option to try and control flies, beetles, wasps and other insects around the home. The need for these traps to be clear in many of the designs lead to some very elegant glass examples as well as more utilitarian mesh variates.